Heat olive oil in a large pot or dutch oven over medium heat. Add chopped garlic and onion and sauté, stirring occasionally until lightly browned, about 5 minutes. Add carrots and cook, stirring occasionally, for another 4-5 minutes. Add bell peppers and cook until tender, about 10 minutes. Pour in the stock and add the cumin, paprika and salt. Bring to a boil, reduce heat to low, cover and simmer for about 20-25 minutes until vegetables are very tender. While the vegetables are simmering, prepare the couscous. In a small saucepan, bring broth to a boil over medium-high heat. Remove from heat, add couscous, cover and set aside until the soup is ready (at least 5-10 minutes). 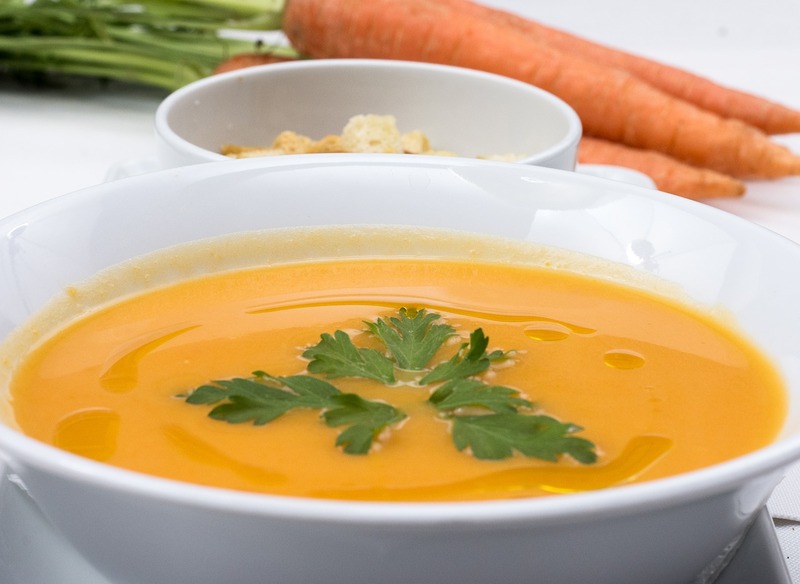 When the vegetables are tender, purée the soup in the pot with an immersion blender, or transfer to a blender. Stir in the harissa and add salt to taste. Ladle soup into bowls. Fluff couscous with a fork and swirl into the soup. Squeeze lemon into soup. Sprinkle parsley. Enjoy!